Evidence shows close links between alcohol use and contraction of HIV/AIDS and between heavy alcohol use and detrimental effects on the immune system. View the booklet "Alcohol and HIV/AIDS" here. There is a growing body of evidence on the linkages between harmful use of alcohol and the HIV/AIDS epidemic. Addressing alcohol use as a risk factor may enhance the results of both new and already existing HIV/AIDS programmes. 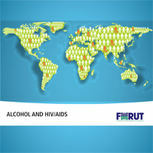 The FORUT booklet “Alcohol and HIV/AIDS” present the current knowledge base and suggests how governments and NGOs can integrate alcohol and HIV prevention. The booklet “Alcohol and HIV/AIDS” can be viewed here. HIV/AIDS presents a major obstacle for international development. Although progress in combating the disease has been significant, driving the number of new HIV infections steadily lower in many regions of the world, major challenges lie ahead. One of those involves the linkage between alcohol use and HIV/AIDS. The booklet “Alcohol and HIV/AIDS” outlines three aspects of the association of alcohol use and HIV/AIDS, including: alcohol’s contribution to the spread of HIV/AIDS; alcohol consumption and the progression of the disease, and the effect of alcohol use on the course of medical treatment. Research findings indicate that both the biological and behavioural effects of alcohol on the body must be considered. Evidence shows close links between alcohol use and contraction of HIV/AIDS and between heavy alcohol use and detrimental effects on the immune system. The evidence supports a causal connection between alcohol use and adherence to ART treatment. While the link between alcohol and HIV/transmission is supported biologically, the behavioural causeway may be explained by other factors. Researchers therefore hesitate to conclude that there is a causal link between alcohol and HIV-transmission. Obviously, more research is necessary, both to further confirm the association between alcohol and risk of HIV infections and to characterize alcohol use as related to HIV infection at the level of the sexual event. On the other, already existing knowledge should be used in designing new HIV/AIDS and TB programmes. The new FORUT booklet will assist programme designers in the government sector and in civil society to aadress alcohol use and HIV/AIDS in an integrated manner.